Now this is an arrival. With my legs positioned in an authoritative, captain-like stance, my sunglasses on and the wind playing havoc with my barnet, I open the throttle and the little boat glides across the water. My god, this is great: blazing sunshine, Tippex-white cliffs and sea the colour of blue curaçao. And not a single soul in sight. This is Ithaca, Greece’s raw, rugged and largely ignored Ionian island, and the fabled home of Odysseus, the hero of Homer’s 8th-century BC epic The Odyssey. The poem recounts the story of Odysseus’s return from the Trojan War – a gruelling, ten-year schlep – but my 21st- century mission is far more chilled. Starting with a 15-minute hurtle across the sea from Kefalonia, my boyfriend Adam and I have made the decision to explore the two islands by sea. Because why Kia Picanto when you can speedboat? The A-listers know what I’m on about. 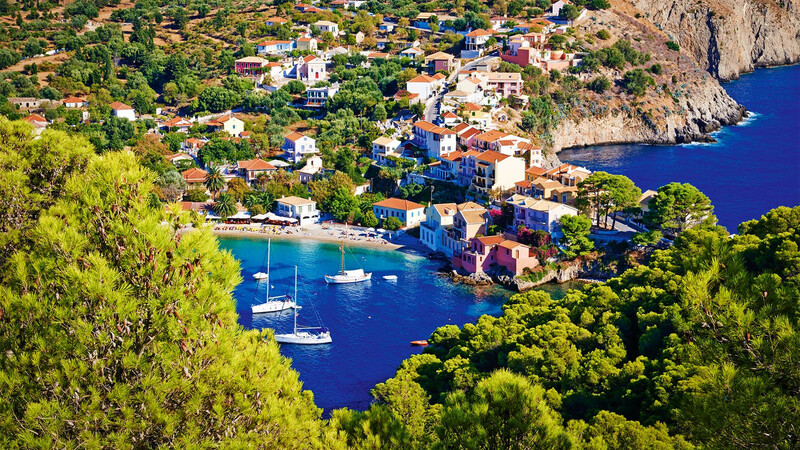 Unspoiled by mass-market hotels and chain restaurants, the north of Kefalonia – the largest of Greece’s Ionian islands – has managed to escape the red-faced tourist brigade. 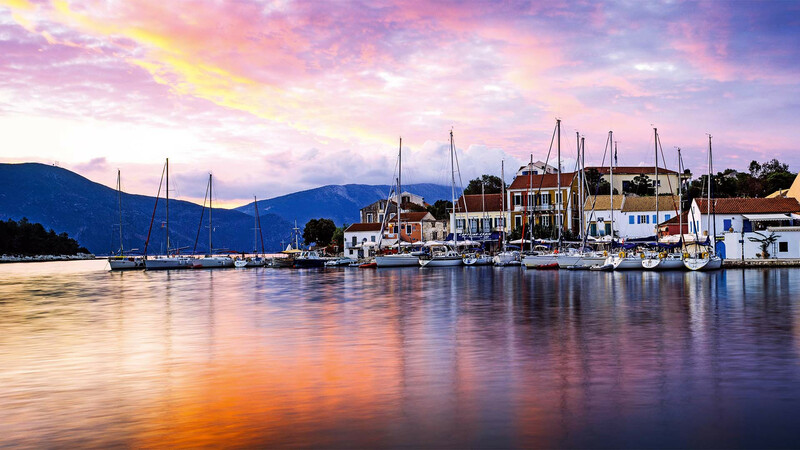 Fiskardo, the quaint Venetian-style harbour town, and one of the only places to not be savaged by the devastating earthquake of 1953, attracts low-key celebs and moneyed, boho travellers. I sip ouzo by the water while slick Europeans clad in floaty linen plop off the walkway into dinghies, setting out to explore the dozens of bays that dot the surrounding coast, or whizz across the water to their superyachts. 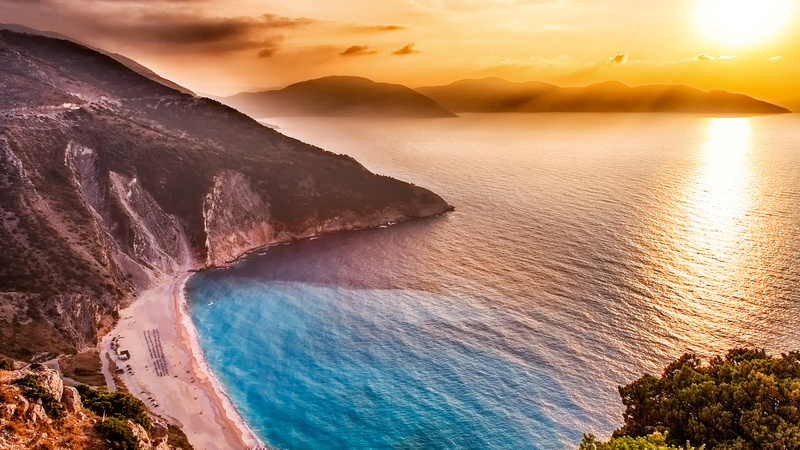 Yet despite the cosmopolitan crowd in this part of the island, the majority of Kefalonia is relaxed, rustic and brilliantly untamed. 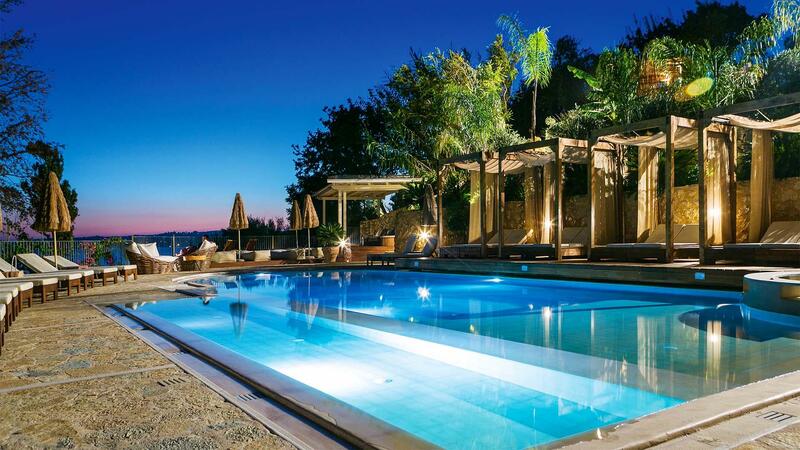 Famed for producing the ‘quickest’ of the Greeks (we’re talking wit, not four-minute miles), when you’re not making new friends here you’re bound to be splayed out horizontal in a pleasing state of sun-drenched zen. It’s the beaches that’ll get you. There are hundreds – yes, hundreds – to choose from, and they’re all cracking. We start in Assos, a Venetian-era village with a calm, pebbly bay that sits at the base of a 16th-century castle, followed by Petani, a long curve of sand stroked by gentle emerald waves that are perfect for beer-in-hand, lilo-based escapades. Then, of course, there’s Myrtos. Reached by a steep and windy cliff road, it’s Greece’s pin-up beach, with a dazzling curve of striking white cliffs that slip down to large, cream pebbles and water so bright that you can barely look at it. But that would be a waste. After a bit of pacing back and forth, doing the obligatory same-picture-from-a-different-height thing, I chuck my camera aside and charge face first into the electric blue, battling waves and the occasional Greek child. Getting back out is just as elegant; after ten minutes of subtly trying to extract myself with a painful hobble over the stones, I join a group of heavily paunched, Speedo-clad men, reversing crab-like out of the sea, on all fours. Daniel Craig – this is how it’s done. Folding the lilo into the back seat of our hire car (you can’t see it all in a speedboat), we set out along wiggling, undulating roads to explore the interior of the island. 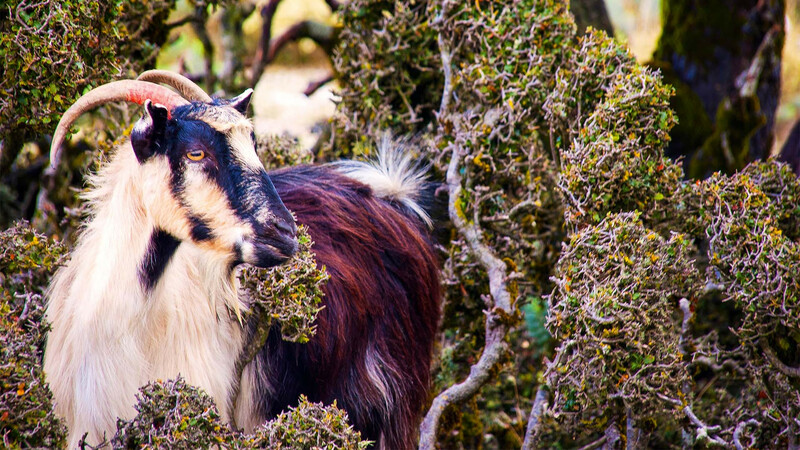 It’s a knock-out combination of rolling vineyards full of robola – the island’s own white grape – and sun-scorched mountains dotted with tufty green plants. 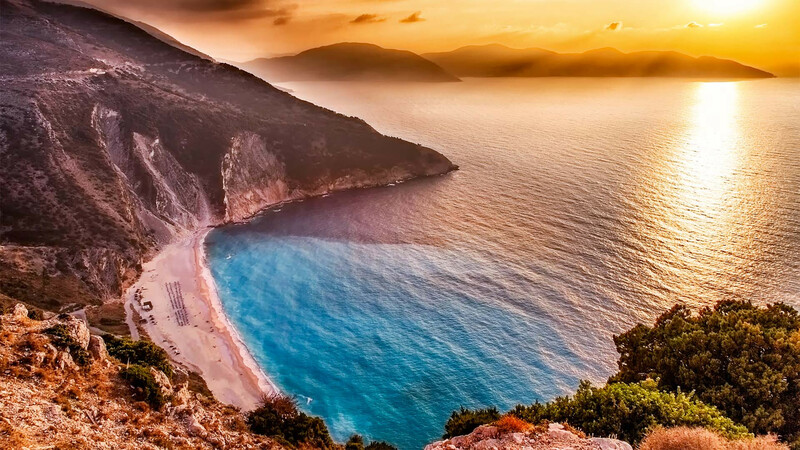 It’s this unique landscape that has led some academics to claim the island Homer detailed in The Odyssey is – in geographical and geological terms, at least – much more similar to Kefalonia than Ithaca. So 3,000 years on, the site of Odysseus’s kingdom remains disputed; not only by battling scholars, but by several territorial Greek grannies that we encounter, too. Wherever it is, Homer had an enviable way with words. “It’s a bit rough” was the quote that really inspired me when I was forced to read the book at school, while “the land is good for goats” was the other. He was right about that one. Razzing the one-litre hire car around near-vertical hairpins, I spot giddy mountain goats tap-dancing next to olive trees, neck bells tinkling in the balmy breeze, and their naked, shaved backsides on full display. “It keeps their body warm but their bum clean,” a craggy-faced farmer tells me after I pull off the road to take a picture. For close-up mountain action, though, you need a bigger engine – and an expert. I meet up with Giorgio ‘George’ Potamianos, the thirty-something owner of Outdoor Kefalonia and a bit of a modern-day legend in these parts, thanks to his rugged good looks, quick banter and adventurous spirit – he recently kayaked from Kefalonia to Venice, and spent entire winters camped out on the mountain as a teenager. As we bump along in the back of his Land Rover, he breaks up interesting facts about Mount Ainos (or Black Mountain, so-named thanks to the dark pine trees that blanket the slopes) with tuition on how to swear in Greek (try calling someone a malaka next time they cut you up). A national park since 1962, the mountain is home to more than 400 varieties of plant, an abandoned 700-year-old ghost village and an extended family of 40 elusive wild ponies (I catch a glimpse of a tail, but George spends most of the time pointing out their day-old dung). On an island like this, that’s no big deal. This is peaceful Greece at its very best, and you’re constantly finding whole acres you can enjoy all to yourself. “We do have policemen here but they’re all stuffing their faces with donuts,” George says, while furiously charging around the next bend. “We don’t have crime on this sleepy island,” he adds. Or driving penalties, I hope. Homer also claimed that Odysseus’s home produces “handsome men”, and George is just one of them. As lazy sunbathing guilt starts to kick in, we meet up with his cousin Lefteris, a former professional rower and now part-time guitarist and kayaking don. Back on the water, he sits me in the front of a two-person kayak, while Adam is lumbered with steering responsibilities at the rear. What follows is a tricep-burning, 10km farce, where sporadic strokes are punctuated by swear words (in Greek and English) as we try our best to paddle in unison over the surprisingly choppy open water. Still, domestic disputes aside, it’s a fun way to travel south from the island capital of Argostoli, where yet more crazy beautiful coves, only accessible by boat, scatter the coastline, and caves – many of which are home to the endangered monk seal, only found in Kefalonia – can be explored, too. It’s the most taxing thing I do all week, but that doesn’t stop us refuelling with maximum enthusiasm each day. Over the course of the trip I demolish dips, fish, kebabs, and several helpings of the island’s ubiquitous ‘village sausage’ (you’ll find it on every menu). Back in Fiskardo, we meet Tassia, a humble, smiley celebrity chef who owns one of the most celebrated harbourside restaurants in Greece, where meat pie (the island’s signature dish) is plated in hefty pastry-topped portions by her chirpy brothers. But it’s the local yoghurt that’s my favourite. Delicious, creamy mounds are served with a selection of plum, fig and grape compotes, washed down with a viscous, lip-tinglingly fresh strawberry-infused liquor. An equally epic meal comes at Aristofanis – a low-key outdoor seafood restaurant in Argostoli. Plates of seafood chosen for us by the waiter (“We’ll eat everything,” we tell him) spill out of the kitchen, among them grilled octopus, prawn saganaki, mussels, mackerel and a salad crowned with a huge slab of creamy feta. Nearby, a clan of elderly men catch the last of the day’s sun; bottle of Mythos beer in one hand, fishing rod in the other. The next day – ditching the hire car for a speedboat again – we follow their example. I grab a chilled beer from the cool box, stretch out across the deck and soak up one last hit of Kefalonian sunshine. 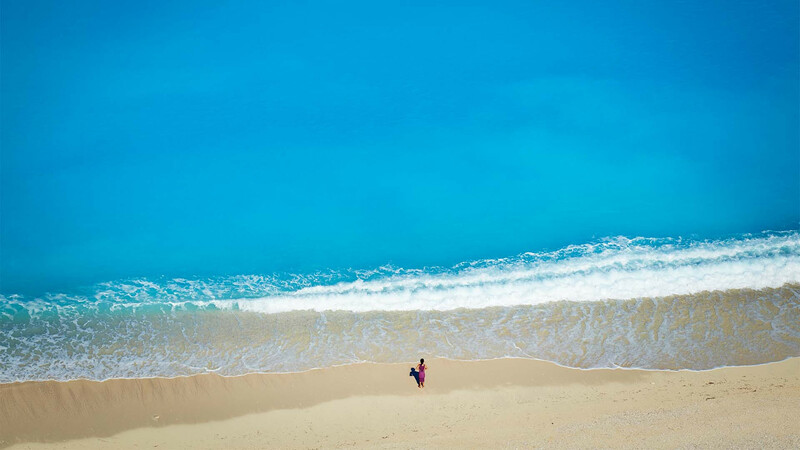 This is the real Greece, and I have it all to myself.